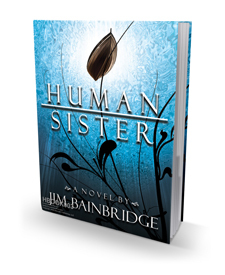 Editor Mark R. Brand interviews Jim Bainbridge, author of Human Sister, now available from Silverthought Press. "Jim Bainbridge’s novel, Human Sister, is a fast-paced, exciting, and beautifully-written account of an all-too-possible, near-future world in which the ethics and choices of humanity are put to the test. The novel is deceptively easy reading—I say “deceptive” because the plot is intense and the writing smooth—but underneath, the book is anchored by complex philosophical and ethical questions, complex characters, and the power of new and innovative ideas. Human Sister takes science fiction into literary territory that it too seldom visits: a place where well-developed characters emerge with sparkling originality through sensuous language and imagery." —Laura Pritchett, author and winner of the PEN USA Award, the Milkweed National Fiction Prize, and the WILLA Fiction Prize. Click to purchase your copy from Silverthought Press. Editor's Note: Interview may contain minor spoilers. Mark Brand: Thanks very much Jim for taking the time to do this interview. Human Sister was one of the best things I read last year and I wanted to take some time and chat with you about this astounding book. First up, I'll get the sci-fi fanboy question out of the way; I love the sort of 70’s-style James-Bond-ish self-made modern-day-villa/fortress setting that significant portions of the book take place in. This wasn’t just a trope unique to film, either; it made its way into some of the best popular fiction from that time. I think there’s a little Hugh Hefner/Howard Hughes in all of us and the effortless money-facilitated jet-set lifestyle juxtaposed with a cloistered, protected ethos is a narrative device that rarely disappoints. What was your inspiration for the compound that Grandpa, Sara, and her brothers call home? Jim Bainbridge: Having spent much time in Northern California, especially in Berkeley and in the lovely wine country of Sonoma County, I was naturally drawn to placing most of the action of the book there. The fortress nature of the main characters' home, which I located in a secluded area of the Russian River Valley, was essential to provide the security Grandpa needed for his and his family's protection against anti-android fanatics and to provide the secrecy necessary for his illegal development of a new generation of conscious androids. As for what you refer to as the cloistered ethos of portions of the novel, I intentionally wanted to stay away from the whiz-bang, gadget-loaded variety of sci-fi, favoring instead the development of the internal struggles of the main characters as they are forced to respond to external pressures and dangers. MB: Keeping for a moment with the inspiration background, I was also fascinated with what you did with First Brother and the rest of Sara’s siblings in terms of characterizing them. Being a fan in particular of '70s and '80s sci-fi, I could see all sorts of spiritual homages to characters like the Replicants from Blade Runner and the boy from D.A.R.Y.L. Is there a particular image or place that you encountered an inspiration for how you’d characterize your not-quite-humans in Human Sister? JB: Like a Monet painting overbrimming with multifarious colors, each moment of reality is an explosion of innumerable simultaneous events that showers us humans with a plethora of sensory stimuli, only a small fraction of which makes it into the spotlight of our conscious attention or gets recorded by our brain's retrievable memories. Intelligent machines need not have such human limitations. Indeed, one of the most significant problems in the field of artificial intelligence has been how to get machines to focus attention on what we want them to by filtering out what we deem to be distracting stimuli irrelevant for the purpose at hand. It was this recognition that intelligent machines have the capacity to attend to a much wider range of sensory stimuli than do we humans that led me to spice First Brother's narratives with what may seem to be odd details. MB: One of my favorite overarching themes of Human Sister is the attention that it occasionally draws to the habitual fear-mongering and conflict-driven decision making of the US government. This is one of those "yeah it’s the future but it’s also the world we already know" moments, and I felt like it played interestingly with hot topics in current discourse like copyright protection, patent law, human experimentation, extraordinary extrajudicial institutional methodology, and the climate of fear promoted by a xenophobic culture driven by subjective mass media. Can you share with us a little bit about where this comes from and how you went about creating this thematic statement? I understand that among other things your education includes a law degree, so was this incidental or something you had in mind from the beginning? JB: Your question states well my perception of the political and cultural inclinations of the majority of contemporary Americans, inclinations that I believe may become dangerously exacerbated by the continuing encroachment of science on what has been considered the core of the human self: its mind and consciousness. My years at Berkeley and at Harvard Law School undoubtedly contributed to my thoughts and feelings on these matters—thoughts and feelings that, as you have recognized, made their way into Human Sister. MB: I found myself wondering at certain points during this book, particularly given how the story eventually plays out and ends, if you were consciously making a statement about men and women and the current state of gender relations. There are moments, for example, where Sara feels compelled or inclined to trust machines instead of living, breathing men, and moments where she has very thematically-sincere and genuine difficulty determining the extent and the authenticity of her relationship to human men. You contrast this with some beautiful moments where machines seem either sadly or grimly more efficacious or reliable than living men, and couch all of this in a story full of tremendously effective symbolic juxtapositions like Sara in the underwater module with Michael and the implied reversal of the machine-inside-man imagery. Am I jumping at shadows or is there a statement we’re meant to take away here about women and men and the state of their relationships to each other during a time when economically the rug has been pulled out from under living, breathing men and trust has been placed in technologies to sustain us culturally? JB: In Human Sister there definitely is a reversal of machine-inside-man imagery, though perhaps it is better referred to as machine-inside-human imagery—I had no intention in writing the book of deprecating men in favor of women. The "rug" that you refer to as being pulled out from under us as supposedly independent viable entities is not merely an economic one. None of us, not even the most select group of a thousand of us, fully comprehends the intricacies of the multitude of operating system and application software, the hardware, and the chemical, biological, and physical manufacturing processes in existence today, technologies in which we are embedded and upon which we rely to a degree approaching that of infantile dependency. To recognize this is at least partially to become aware of how small we are as individuals, and of how humble we should be in the context of such smallness. Our conscious "artificially" intelligent descendents, however, may be able individually to incorporate the knowledge of tens of thousands of human experts, perhaps even of all of human civilization. What then, I wonder, will humble them? MB: That motif is all over this book, for sure. I was thinking about a few slightly more specific incidents, though, and how they relate to Sara, who frankly is one of the most emotionally nuanced and objectively interesting female characters I've read in a long time. Without giving away too many spoilers, I'm thinking about a few specific examples where Sara seems to actively place her trust in her brothers, or finds herself at their mercy, and she seems to just accept that this is the way things need to be. In these incidents, it's almost as if she makes the decision actively, and not out of fear or ignorance. In a few such moments, she seems to understand the gravity of what she does better than anyone, including the AI and certainly at times even the reader. The enormity of the AI comprehension is palpable at several points during this book, but there are moments of very human understanding, too, and Sara seems to approach them with deliberate calm, even when we as readers are inwardly screaming for her to snap into fight-or-flight mode. That kind of inner-strength at work, Sara confronting when she should or could cut and run, is where I started to imagine that there might be a message there about men, women, (or at least people in general) and trust. There are layers of trust happening between her and Elio and Grandpa, and certainly Michael, and this seems inconsistent. Sometimes people aren't to be trusted or have betrayed or failed to earn trust (Mom and Dad, the authorities), and sometimes her brothers do earn it, despite the terrible duality that implies. Often she doesn't even trust herself and is given ample opportunity to test this. Was this a conscious message you were going for, or was it incidental to the plot you had woven? JB: I don't think that Sara's responses to the difficult situations you refer to stem from trust—after all, she is a very intelligent young woman—as much as from love and, in the light of difficulties, from the loyalty, caring, and toughness that true love engenders. The Greek Stoic Epictetus, whom Sara quotes in the novel, wrote that difficulties are things that show us what we are. Sara then wonders, in light of her grandfather's deceptions, whether Epictetus "should have added that, in their extreme forms, difficulties are things that leave innocent no one who encounters them." How easy it is to judge harshly those—even those whom we supposedly love—who, in difficult situations, make what we believe are terrible mistakes. How easy it is to cut and run. But not for Sara, who concludes late in the novel: "how could I both love and judge?" MB: There are quite a few great moments where Sara and her brothers (and occasionally Elio or her grandfather) engage in games of symbolic logic for one purpose or another. Your graduate work at Berkeley was in mathematics, so I imagine this also is not by accident. My question is: as clever as this story is, and considering the prominent symbolic imagery sprinkled throughout, I’m half-convinced that there are codes or hidden signifiers hidden all over this book that I’m meant to only discover if I’m looking particularly closely. Or not. I could be wrong about that. The book is written in a very straightforward, accessible fashion, so maybe I’m looking for codes that aren’t there, but if there are, maybe you could give our readers and I some clues about where to start. JB: The subconscious mind is much more powerful and clever than is the conscious mind. While writing the book, I often would reread what I had written a day or so before and discover a theme or idea that I was not aware of as I wrote that particular passage. Readers of the novel will undoubtedly find ideas, emotions, and allusions in the book of which I am still unaware, and they will thereby become co-authors of the Human Sister that they read, experience and, I hope, enjoy. MB: I just wanted to wrap up by asking if you had any other projects on the horizon we should be on the lookout for? Also, where can our readers find out more about you and your work? JB: Much of what I have been writing has been appearing in literary journals, a few of which are listed in the Acknowledgments page at the beginning of Human Sister. I have also been taking notes on what might become—though no promises here—a sequel to Human Sister about Michael and his children. MB: Very cool, and thank you for taking the time to talk to us. Mark R. Brand is an editor of Silverthought.